One serious pitfall can cause the entire security system to fail. A "pitfall" is a risk or vulnerability in your system. They typically result from sloppy workmanship or DIYers. Therefore, proper design and install are critical. Listed below are common system pitfalls to avoid. Location isn't just for real estate. 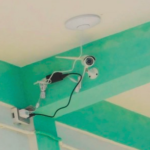 Security cameras must be carefully placed on the property. Two critical components of location: height and position. Cameras too low to the ground are easily covered, knocked out of position, or destroyed. It's best to place cameras in a hard to reach spot. Secondly, the position is important. A clear line of sight is necessary without being too far away. You don't want trees blocking the way or blurry images. Exposed wiring is an eyesore but, it's also a huge security risk. Wiring can easily be disconnect or cut. At a minimum, use conduit to hide exposed wires. Poor quality is usually a result of doing it yourself or an old system. Either that or you have a system from 1980. These cameras will fail when they're needed the most. You can see that someone did something but, not who did what. Having high-quality cameras, maybe analytics is key to an effective system. For this reason, we advise you to update your security regularly. It takes time and skill to design an effective surveillance system. You can't just randomly place cameras. Strategic placement will help to minimize or eliminate blind spots. Blind spots leave your business or property at risk, especially for crime. Plus, a well-designed system can save you money. We can maximize coverage while reducing the amount of infrastructure. Fewer devices, network switches, enclosures, etc means more money in your pocket. For example, instead of trenching and running cable to a camera, use a varifocal camera to zoom in from another location.